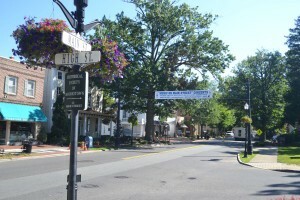 The Moorestown Business Association was established in 1974. Since its beginning, its mission to bring together businesses to collaborate and improve relations among businesses, the township and residents hasn’t changed. However, like most things, as time goes on, changes need to be made to fit the current world. Ten years ago, the president of the MBA was featured in an article in The Moorestown Sun’s first issue. For its anniversary, The Sun sits down with current president Don Powell to see what has changed with the MBA and business itself in Moorestown over the past 10 years. Powell has been a business owner since 1986 with Powell Building Cooperation, now Powell Energy & Solar, LLC after merging his construction expertise with his solar technology expertise. He decided to have his business in Moorestown because he lived here. However, he said there are advantages to starting a business in Moorestown. The community feels a sense of loyalty to the town, it has a great and unique downtown shopping district, and families are willing to buy local to keep things that way. “It is a very friendly town. People feel an allegiance to the town. They actually shop local because they want the shops to be there. There are towns where people don’t care about the merchants. Here, people are willing to spend a few extra dimes at their local merchants, which is a great advantage,” Powell said. When starting a business, he said the big questions to ask are: “Is there competition?” and “Is there an audience for my product?” In the 2005 Sun article, the question often forgotten by new businesses was “How are you going to market your business?” Powell agrees that is still true today, especially with smartphones and the Internet being bigger than in 2005. However, he still feels the former two are the biggest questions to ask. “You certainly don’t want to try to start up a business and find there is no audience for it, or you have three other people doing the exact same thing,” Powell said. The MBA is there to help businesses in Moorestown be successful. Members are added to the MBA’s directory, which includes useful information such as phone numbers, events and calendars. The association also offers monthly meetings and networking events for members. These are great times to get to know other businesses as well as learn different strategies, talk about issues and network, Powell said. It was through a meeting in February the MBA made its first informal subcommittee called the Moorestown Merchant’s Council, which devotes its time to the needs and assistance of the retail merchants in town. “We are here to help businesses, promote businesses and help people do more business,” Powell said. The MBA had 114 members in the summer of 2005. It now has 292 members, doubling in the past 10 years, despite the recession. Due to its increased enrollment, the MBA can do a lot more than it could in previous years. From 2005 to now, the MBA has been able to donate money or items to the township. Starting in 2008, it was able to give scholarships to two graduating seniors living in Moorestown pursuing a major in business or a related field and community or extracurricular service. The MBA hosts six major events in town. In 2005, the MBA hosted four major town events: Moorestown Day (since 1976), Candlelight Night (1976), Autumn in Moorestown Festival (1993) and the Easter Egg Hunt (1993). Since then, it has added the Halloween Parade (2006) and “Music on Main Street” Concerts (co-host, 2013). According to Powell, the MBA is going add two more events to try to help businesses in town, specifically in the shopping districts, Main Street, Chester Avenue and Lenola. The events are Ladies Night Out in October and Daffodil Day in spring 2016. Ladies Night Out is planned to be a Thursday in October where merchants in town will host promotions, serve special refreshments and offer discounts to shoppers. Daffodil Day, a spinoff of an event from Nantucket, is a day where merchants will get into the daffodil theme with yellow colors and spring freshness. “We’ve been doing the same six events for a number of years. I and other members thought it would be a good idea to do more things to bring people into the town and businesses. We thought we’d try to add more events and see if we can’t create a little more enthusiasm in our shopping districts,” Powell said. The downtown-shopping district is one of Moorestown’s biggest appeals and different from other towns. The walkable and beautified streets, as well as variety of retailers, offer a unique shopping experience. Having local merchants, as opposed to big retail stores, in the shopping district is an advantage Moorestown has. With local merchants, residents know their business like the back of their hand. “The nice ambiance of being able to shop in little stores and a nice variety of stores and product offerings is what makes the downtown shopping area special,” Powell said. Since 2005, Powell said the biggest changes there were in the proliferation of eateries and boutique stores. In 2005, Main Street had only two restaurants, according to Powell; now there are seven. Also, many spaces that used to be offices have converted into boutique-like shops, and this is continuing to increase. Powell hopes for the future of the MBA that more Moorestown businesses that aren’t members join. There is strength in numbers, and Powell feels with more people involved, the bigger voice it will have within the township, as well as the power to help each other and the town be successful. To learn more about the MBA, events or membership visit moorestownbusiness. com or talk to a current MBA member.